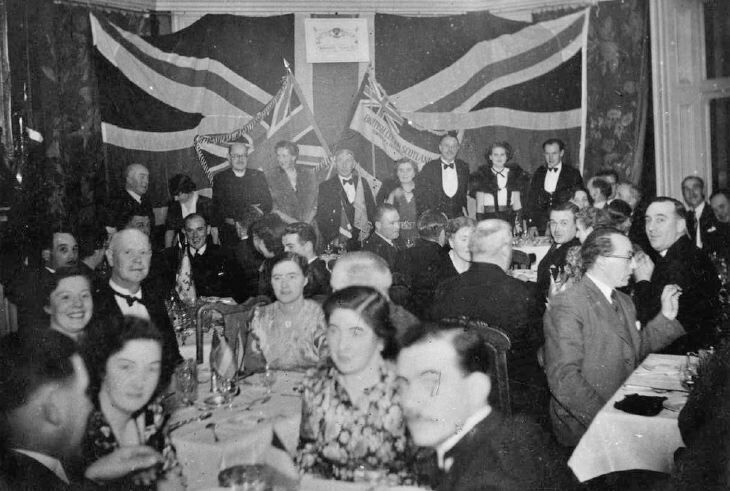 Monochrome photograph, mounted in card folder, of a British Legion dinner. Top table left to right: Mr Maclean (banker), daughter Anne, Rev William Macleod, Mrs Rawstone, Mr & Mrs Brannen, Mr Rawstone, ? (road surveyor's daughter), Ian Mackay (nephew of W D Munro Over Skibo. 'Juniors table' left to right: Jim Murray, ?, Jock Sutherland and wife, Bob Donald, Bill Wright, Alan Mackenzie (partially hidden). Right hand edge: Davy Mansen, Davy Duff.